Hundreds of people have been killed after a 7.9-magnitude earthquake struck Nepal and India with the most severe damage seen in Nepal’s capital, Kathmandu. The quake also caused an avalanche on Mount Everest. 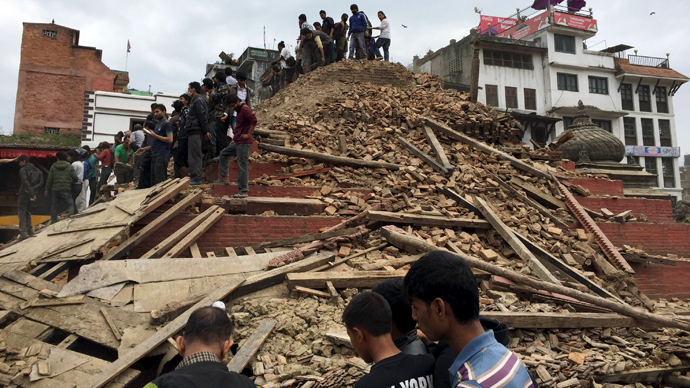 Police in Nepal have confirmed the death toll following Saturday’s earthquake has passed 5,000, according to AP. In Bangladesh and India, 61 people have been killed, while the Xinhua news agency reports 25 people lost their lives in Tibet. The total death toll in Nepal has risen to 5,006 according to figures from the Home Ministry, while on Tuesday, the Nepalese Prime Minister Sushil Koirala said the final toll could reach 10,000. The UN has launched an appeal to send $415 million to an estimated eight million people effected by the earthquake in Nepal. The agency hopes to raise this sum over the next three months. Riot police in Nepal have clashed with residents in Kathmandu who are desperate to leave the stricken capital, which is running low on supplies. People gathered before dawn at the main bus station, as the government had promised to provide special transportation services. However, when the buses didn’t turn up, scuffles broke out between the crowds and riot police. "We have been waiting since dawn. They told us that there would be 250 buses coming, but we haven't seen any of them," said Kishor Kavre, a 25-year-old student, speaking to AFP. "We're in a hurry to get home to see our families, but we've no idea when they're coming now. I think the government is struggling." India has expanded its rescue and relief operations in Nepal beyond the capital Kathmandu. They have sent Gorhkha soldiers to some of the most remote areas in the country to assess what assistance is needed. “We now have a better appreciation of the area after our helicopters have undertaken numerous sorties. We have conducted chopper operations to the affected areas outside Kathmandu today. A AN-32 plane also landed at Pokhara today,” Defense Secretary R.K.Mathur told reporters. Tremors are still being felt in remote areas of Nepal, as aid finally managed to reach villages who had been left to fend for themselves since the earthquake struck on Saturday. “The ground keeps shaking, even this morning it did. Every time it feels like we will be swallowed, that we will die now. I want to get out of here!” said Sita Gurung, 24, whose home had been wrecked, the Times of India reported. A woman in Nepal has been rescued after being buried for 50 hours under rubble following the devastating earthquake. Sunita Sitoula was trapped after a five-story building collapsed. However, India’s National Disaster Response Force managed pull her free on Monday. She was taken to hospital where was met her two sons and husband who were unhurt following the quake. “It feels like I have come into a different world,” said Sitoula, according to NDTV. Nepal has praised India for its help in providing aid to the mountainous country following Saturday’s devastating earthquake. New Delhi has offered Nepal a ‘blank check’ to aid the stricken nation. “India took the initiative in relief operations, which other countries followed. We are thankful to the government of India that it was kind enough to extend a ‘blank check’ after the shattering earthquake. It has done tremendous work to provide help,” Nepal’s Ambassador-designate, Deep Kumar Upadhyay said. Upadhyay said there were no coordination problems between the two nations and that the aid would have a positive impact on the people of Nepal. As many as eight million people have been affected by Nepal’s earthquake, according to the United Nations. “According to initial estimations and based on the latest earthquake intensity mapping, eight million people in 39 districts have been affected, of which over two million people live in the 11 severely affected districts,” said the latest assessment from the UN Office of the Resident Coordinator. Meanwhile the World Food Programme and UNICEF are continuing to distribute first aid supplies. The World Health Organization alone has distributed medical supplies for 40,000 people. The capital’s international airport, Tribhuwan, has lately seen kilometer-long queues of desperate people trying to leave Nepal. The authorities briefly shut down the airport on the day of the major earthquake, but it is still hard for them to cope with the chaos. “There is no water here or food. I have been sitting with my wife and child since early morning. We just want to get back home to India now,” passenger Mohammad Pervez told NDTV.